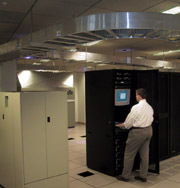 Tide Point Data Center, Inc.
Premier Colocation Facility in Baltimore, Maryland. Thank you for your interest in the Tide Point Data Center. Tide Point Data Center (TPDC), located in Baltimores Inner Harbor, is a premier carrier class data center offering web services and hosting, in addition to colocation, assisted and managed hosting for todays business community. We may be a new venture, but we are supported by our parent company, Garett Group, Inc., a 20-year-old system integrator and technology consultancy. Garett Group, Inc. has been serving the Baltimore community and its need for total on-site support and supplemental consulting to customers own IT departments. With the acquisition on this new facility at the former Proctor and Gamble manufacturing site, developed by Struever Bros. Eccles & Rouse, Inc., the Tide Point Data Center is in a position to leverage a modern state-of-the-art hosting facility with the experience of a veteran service organization. This combination technology and experience is designed to offer Baltimore, Maryland and the surrounding community at large a single source for IT services. Please explore our site and the resources at your disposal to assist you in meeting your IT objectives and your business goals. © 2006 Garett Group, Inc.